Reports are surfacing that Ford Motor Company has decided to discontinue the Harley Davidson Edition trimline for the bestselling F150 pickup – marking an end to the partnership that began back in 1999 and spanned three generations of the Ford half ton truck. 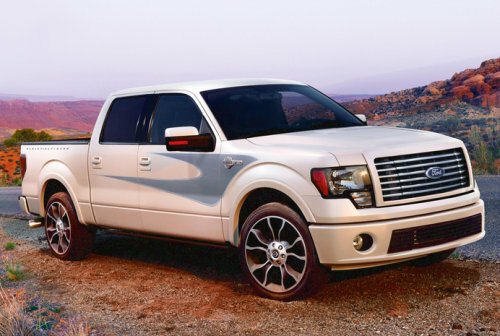 The Harley Davidson Edition of the Ford F150 has served as a premium package since being introduced for the 2000 model year when it packed a similar high performance, supercharged engine to that found in the SVT Lightning F150 (albeit with a touch less power than the Lightning). The package ranged from a performance model in those early years to a pure high end luxury package complete with ultra plush interior finishes in the more recent models – all the while attracting both Ford and Harley Davison enthusiasts alike. Unfortunately, that attraction was not enough as Ford has decided to put an end to the premium F150 Harley Davidson Edition. "We don't have plans for one at the moment," said Doug Scott, Ford Motor Co.'s truck marketing manager. "We've got 10 models including a brand-new Limited Model, which was new for 2013. We feel like we've got the market really well covered." In addition to the slow sales, the Ford F150 Harley Davidson Edition most likely fell prey to a collection of new luxury themed trimlines that most recently included the new top of the line Limited package. Along with the Platinum, King Ranch and Raptor packages, the F150 features far more high end trimlines than it did when the Harley Davidson Edition debuted so not only were sales slow over the past few years – but the company likely expected them to get even slower with so many different trimline options for the nation’s bestselling vehicle. Another aspect that may have caused diminishing interest in the Ford F150 Harley Davidson Edition was the removal of the supercharged V8 that first powered the motorcycle-themed truck. When introduced, the HD F150s packed the same supercharged 5.4L Triton V8 that was found in the SVT Lightning but for the Harley trucks, that engine packed “only” 340 horsepower and 425lb-ft of torque (the Lightning offered 380 and 450). However, even with that difference in output, the F150 Harley Davidson Edition was as much a performance truck as it was a luxury package. Unfortunately, as the SVT Lightning was discontinued, so was the supercharged engine that powered it so as the new versions of the Harley themed truck were introduced – the high performance aspect had been removed altogether. The HD package still offered the higher end engine options for the F150 lineup but none could compare to the blown SVT V8 so the Harley F150 faded in the high performance pickup world. It will be interesting to see if the Harley Davidson name will still appear elsewhere in the Ford F Series lineup going forward, as the company has also feature the HD name on various F250 and F350 Super Duty pickups over the past decade. As was the case with the F150 Harley Davidson trucks, the Super Duty HD trucks featured higher end appearance packages inside and out with the focus being the familiar logo of the American motorcycle company. The Automotive News report specifies that the F150 will no longer offer the Harley Davidson Edition package so that could mean that Ford intends to collaborate with Harley on future Super Duty models. However, the Super Duty pickups have also received a heavy dose of luxury additions over the past few years including the newest Platinum package and that could have the same result for the larger trucks as it does for the half ton models.